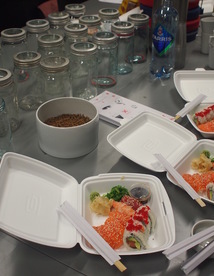 In connection to the HYBRID MATTERs exhibition at Kunsthall Grenland we host a composting plastic workshop. 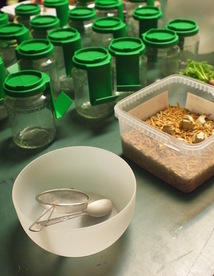 With simple means such as glass jars, common mealworms, and metal nets the participants are invited to make their own composting kit to bring home. Recent research has shown that common mealworms can biodegrade Styrofoam. Kristina Lindström and Åsa Ståhl explores how this new discovery might influence how we will live with or without plastics in the future. 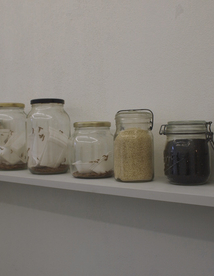 How does composting intervene in the temporality and materiality of plastics? What potential transformations, issues, relations and resources could emerge through composting plastics? We welcome you to a workshop where we speculate on how we can live with or without plastics in the future. What do we do with plastics and what does it do to us? Please bring plastics that you have touched during a day - bring it in a bag or in your memory. We will bring materials and stories from previous events, where we have engaged with plastic munching worms and plastiglomerates. To be determined. This gathering is open for suggestions - please, let us know if you have any favourite beaches or places that you want us to walk and talk on. The third plastiglomerate walk takes place in Önundarfjörður in the Westfjords in Iceland. During this exploratory walk we look for plastiglomerates that is a new kind of rock that consists of plastics, lava, corrals and more. 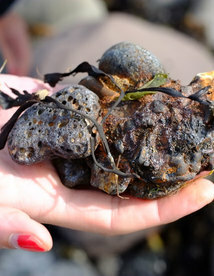 Regardless whether any plastiglomerates are found, the walks allow for plenty of time to discuss and speculate on the matters that emerge when human and natural forces merge. What brings them into being? How can we understand them? Who and what are they a concern to? How could they be used? A plastiglomerate walk takes place in Önundarfjörður in the Westfjords in Iceland. 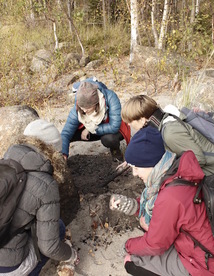 During this exploratory walks we look for plastiglomerates that is a new kind of rock that consists of plastics, lava, corrals and more. Regardless whether any plastiglomerates are found, the walks allow for plenty of time to discuss and speculate on the matters that emerge when human and natural forces merge. What brings them into being? How can we understand them? Who and what are they a concern to? How could they be used? The second walk was improvised. 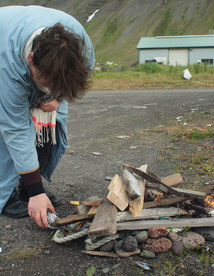 Upon arriving in Isafjörður, we took a quick walk to a “natural beach”. 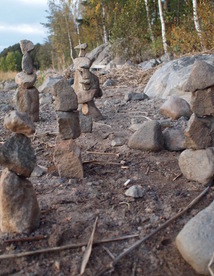 Our companion had studied geology in Iceland and had another approach to stones than we had previously practiced. 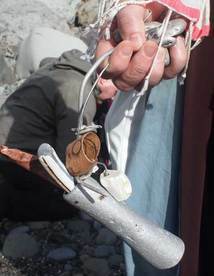 He simply knocked a stone open, to examine it and see if we could discern what it consisted of. 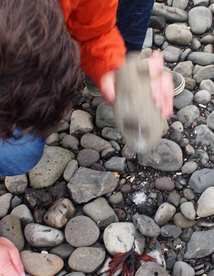 We came to envy the easiness of just cracking a stone open - just to see what’s inside and to examine it on the inside.